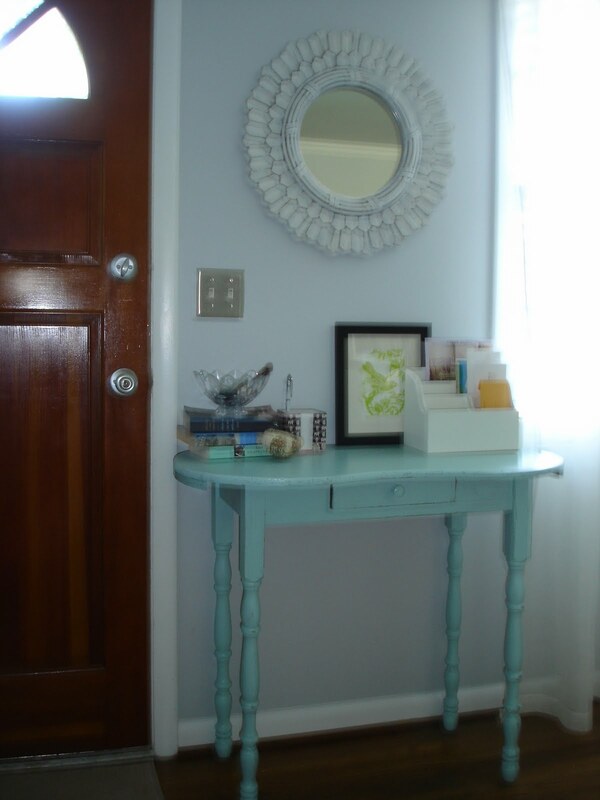 A Guest Post from The Wayman Family Nest--DIY Wall Art! Today I have a guest post from Jennifer from over at The Wayman Family Nest! As I've been in more contact with people from the adoption community, I've stumbled across her blog and truly enjoyed watching both their adoption journey as well as their house projects. 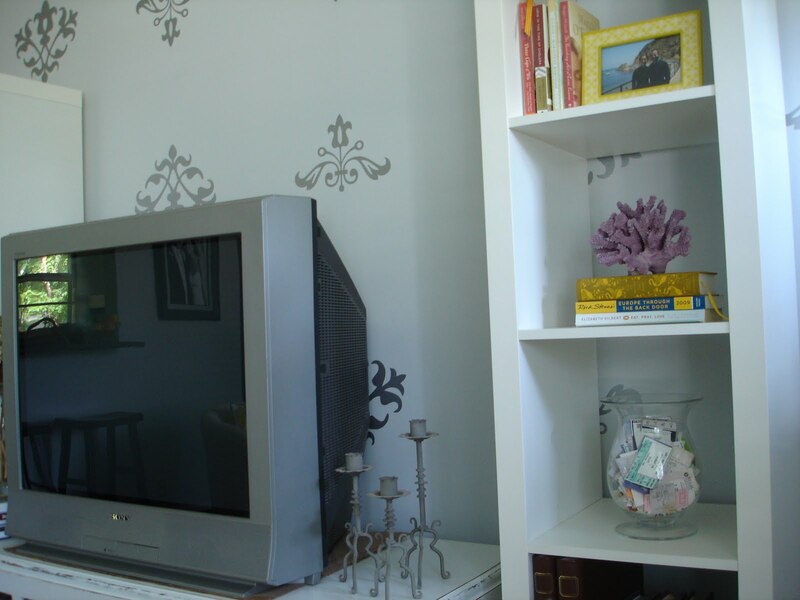 I'm excited to have her guest post today about wall art! I'm definitely taking some pointers :) I'm especially in love with her striped hallway and gallery wall! Hi everybody! I'm Jennifer from The Wayman Family Nest and I'm so excited to be guest posting today here at Home for Hire and sharing some cheap wall art ideas! I'm a 6th grade teacher and future mama. The hubby and I are in the process of adopting a baby boy from Ethiopia. I'm pretty new to blogging, but I've loved connecting with fellow adoptive mamas and other DIY lovers like myself! A few months back, I decided to try out a little DIY project I had seen on Young House Love. I love their ideas for sentimental and cheap wall art. I scored a vintage map off eBay for around $10. 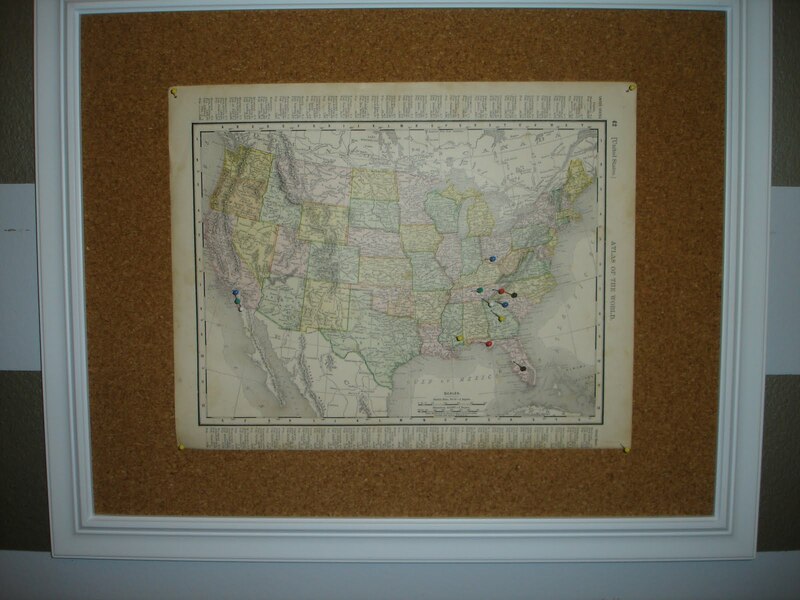 I picked up a white frame from Target, removed the glass, added some cork backing from Michael's, and pinned the map in place. 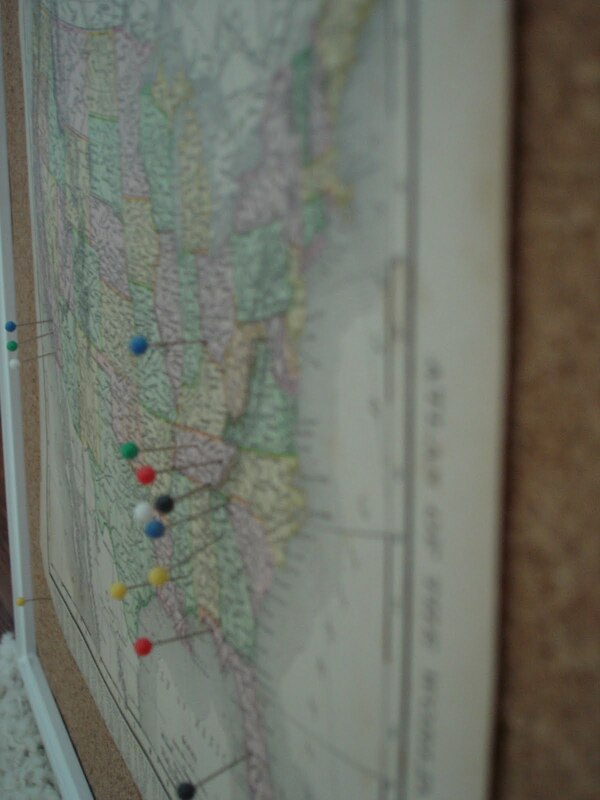 Then I stuck more pins (which are actually called "map pins" from Office Depot if you're looking for some) into all of the places we've been together. How fun is that? And it's interactive too! But it made me realize that we haven't been very many different places together. 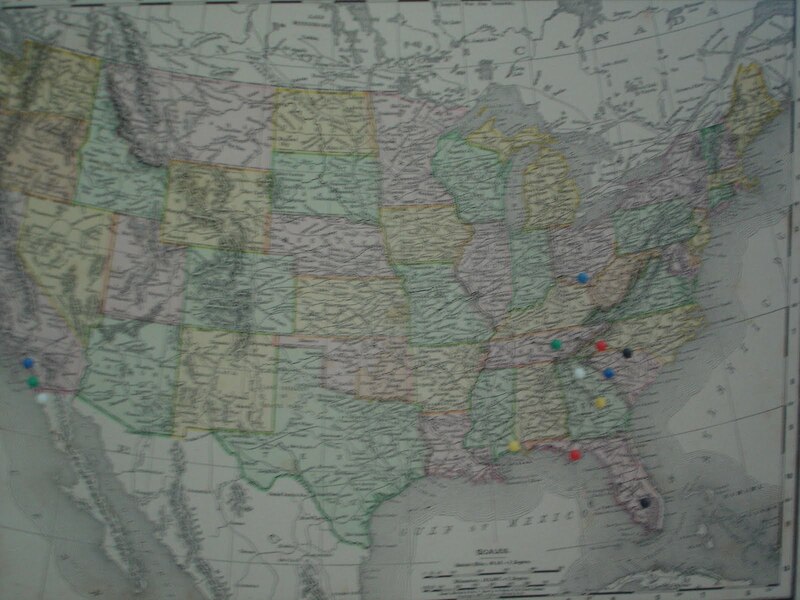 I didn't put 7 or so pins in the same spot for all of the times we've been to the beach together! We need to get out more! Another easy, cheap idea is to frame some of your favorite cards. I picked up this frame from IKEA and popped in 3 cards I had laying around. I had picked up the one in the middle (the eggplant) years ago at the beach somewhere. 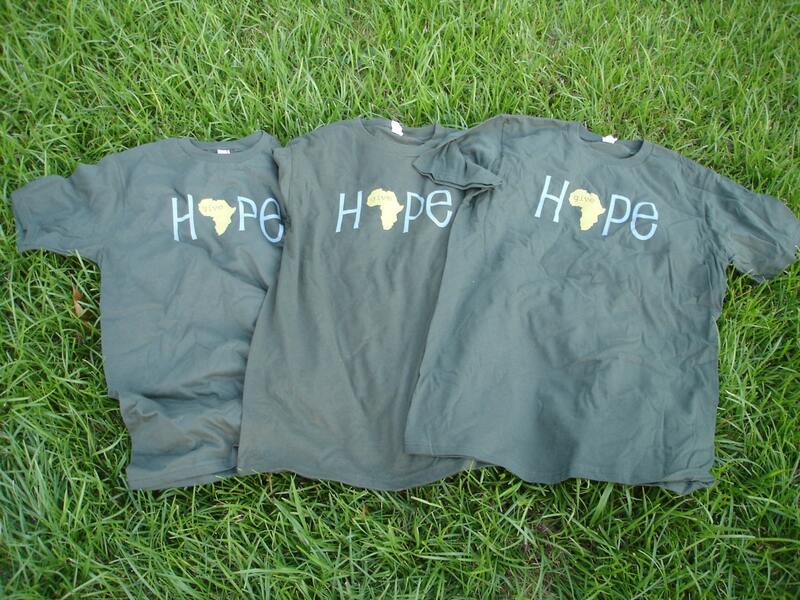 I ordered the other two from Paint4Ethiopia's etsy shop. 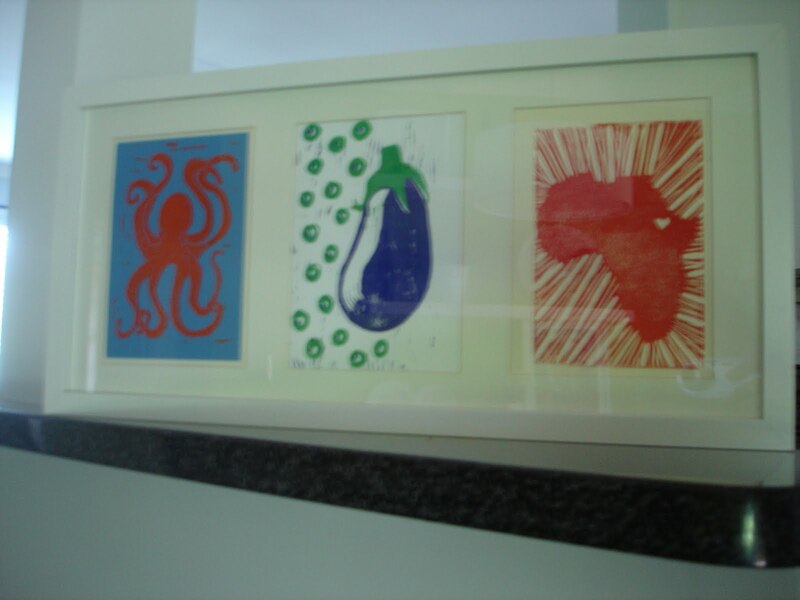 I framed the Africa print with the heart over Ethiopia for our mothers and my sister-in-law for Mother's Day. 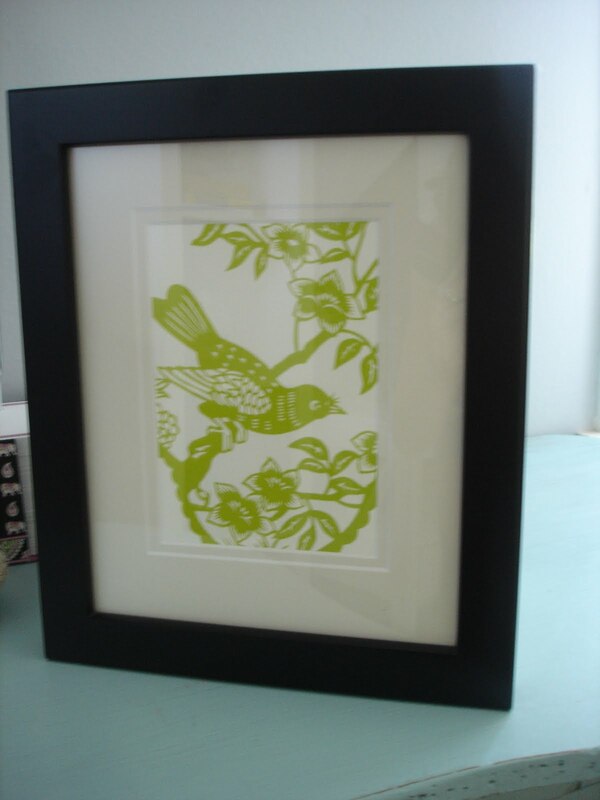 The bird print that sits on the table by our front door is another framed card. I actually have two more framed ones that I haven't found a place for in this house yet (They hung in our old apartment). 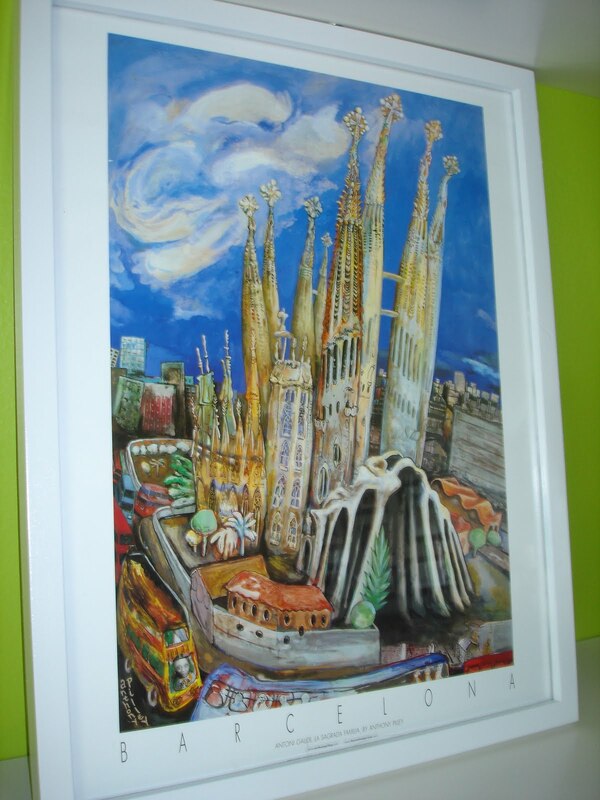 I framed this print that I picked up in Barcelona when I was backpacking in Europe with my sister. It's a reminder of a great trip that we were able to take together thanks to my awesome parents! And if you're reading this Mom and Dad, feel free to send us on another sisterly bonding trip any time! My last idea isn't really wall art, but more like bookcase art. And it's SUPER easy. One afternoon I went through "the special box" (you know you have one too!) that I keep tokens from my hubby and I's relationship (dating through now). 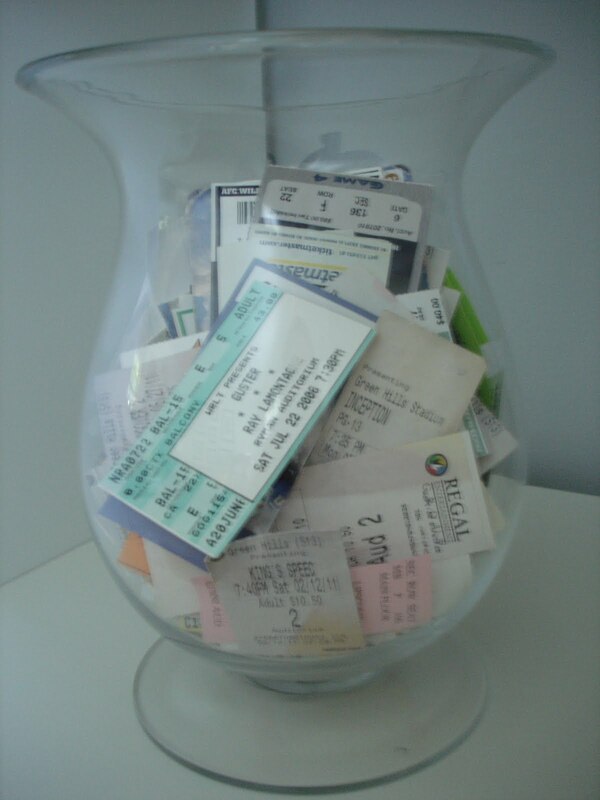 I pulled out all of the ticket stubs from movies, concerts, sporting events, etc. If it was a ticket, I pulled it out. I took this glass hurricane votive that someone had given us for a wedding present and put all of the tickets inside. I display it on one of the bookcases next to our T.V. The hubby and I will pull out a few every now and then and talk about the memories we have of the event. Plus, it's a fun conversation piece when people come to our house! Looking for more cheap wall art ideas? 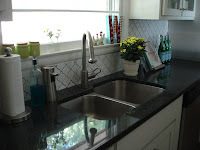 Check out this post from Young House Love. What about you, Home for Hire readers? 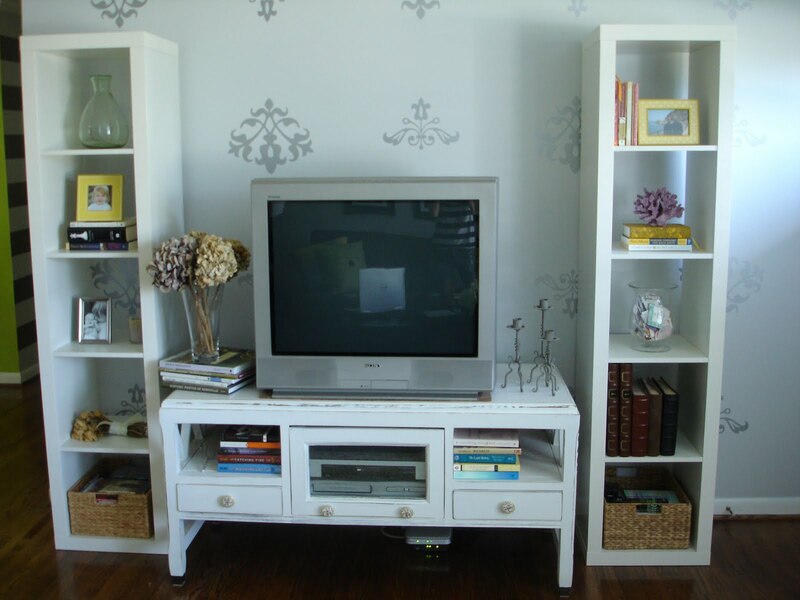 Do you have easy wall art ideas? Share them here! A BIG thank you to Nicole for having me today!